Children 11 years and younger are FREE! With an accompanying adult. 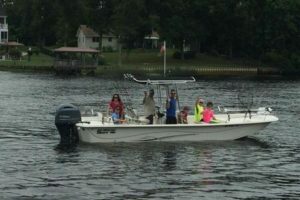 Three more anglers (6 max) may be added to 4 & 5 Hour trips for an additional $50.00 each. Three more anglers (6 max) may be added to an 8 Hour trip for an additional $100.00 each. Prices include all bait, tackle and licenses. You will only need to bring a small cooler with whatever you might want to eat and drink during the trip in addition to sunscreen and any other personal items or medications that you may want to have during your trip. You may bring a favorite rod and reel of your own, but please let me know before hand so that we will not have too much tackle on the boat. I do have limited dry storage on the boat to store your personal items. I also have a larger cooler on the boat for any legal fish that you may want to keep. Payments accepted: Cash, Visa, Mastercard, American Express. Please note that credit card payments will incur a 3% processing fee. In order to secure a reservation, I do require a credit card# and a cell phone# for the person making the reservation. There is no advance charge to the credit card, full payment will be due with cash or credit card at the time of the trip. However in the event of a no-show, the card will be charged for the amount of the reserved trip. There is no cancellation fee for extenuating circumstances (medical emergency, death in the family) as long as I am notified in advance of the scheduled trip. 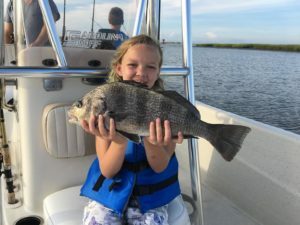 Additionally there is no cancellation fee if we have to cancel due to bad weather; if we are out fishing and we have to cut the trip short due to bad weather, then you will only be responsible for paying for the time we were out. We can also accommodate groups larger than 6 by having multiple boats depending on availability.